Several brands of this interesting item exist, including Mobbo and AirWheel. The devices appear to be simple: put one foot on a foothold on either side of a motorized wheel, lean in, and you're off! Direction and speed are controlled by your shifting weight thanks to the vehicle's internal gyroscopes. A PinWheel T1 electric unicycle. You know you want to take it for a spin. Unlike Segway, there is no full platform to stand on, nor is there a handlebar for stability (but you sure can look cool, casually sipping your morning coffee as you cruise through your commute.) 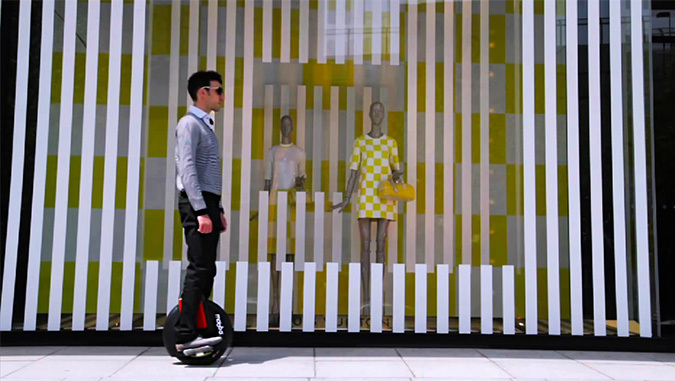 However, AirWheel enthusiasts can use a stability strap or training wheels to get the hang of how to ride. Training may be a bit difficult, but once up and rolling, the ride is apparently "intuitive", according to a recent video-laden article from the Telegraph UK that highlighted one man's journey to master the solo-wheeled scooter. Mobbo too has motivational movies online. A Uni-Wheel model electric unicycle hits the town with "training wheels" for additional support. Currently none of these vehicles are street legal, but can sure shock some sidewalkers. Hey, you're travelling sustainably, and in (a strange but sort of sweet) style! The electric unicycles can deal with rain or even hills, and are doing a small part to help save the planet (with none of that pesky and arduous bicycling needed.) Will they catch on as viable modes of transport? Tough to tell...the future is fickle. However, at least for reasons of recreation, they'll make you a star performer in the urban circus. A Mobbo in the wild. Still imagery does no justice to the electric unicycle's rockin' roll.